Professor Chen Pei-ji of the Nanjing institute of Geology and Palaeontology created a sensation at a conference in October 1996 when he announced that he had found a dinosaur with feathers. He showed pictures of a small theropod, preserved complete, with tufts of hair-like structures all along its back and tail. The dinosaur was named Sinosauropteryx and it was shown to be a close relative of Compsognathus, a coelurid, by Chen et al. (1998). if these truly were feathers of some kind, then all coelurosaurs (see Box 8.5) must have had feathers too, and that includes Tyrannosaurus rex! The discovery was controversial. Was not the specimen just a bird, somewhere in the cladogram above Archaeopteryx ? Surely the so-called feathers were not feathers at all, just shreds of skin or scales? The specimens came from the Yixian Formation, now dated as Early Cretaceous (125-120 Myr ago), near Beipiao, Liaoning Province, China. The sites around Beipiao had already produced spectacular specimens of early birds (see Box 9.3) and many other fossil groups, all showing soft-tissue preservation. After 1996, new discoveries of dinosaurs with feathers from these sites came thick and fast: two maniraptorans, Protarchaeopteryx and Caudipteryx (Ji et al., 1998), the therizinosauroid Beipiaosaurus (Xu et al., 1999a), the dro-maeosaurids Sinornithosaurus (Xu et al., 1999b) and Microraptor (Xu et al., 2003). 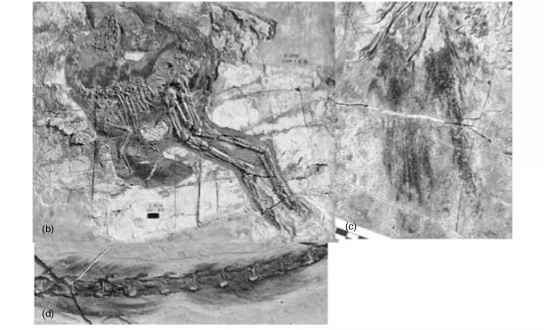 Schweitzer (2001) also reports fibrous feather-like structures in the alvarezsaurid Shuvuuia from Mongolia. if the fossils are correctly interpreted, there is no question then that all coelurosaurs, from the Mid-Jurassic onwards, were feathered (Padian et al., 2001a). But what kinds of feathers, and does this mean they could all fly? These five feather types (illustration (a)) form a sequence that matches a developmental theory for the origin of feathers (Prum and Brush, 2002): reptilian scale ^ bristle ^ down feather ^ simple contour feather or down feather with barbs, but no barbules ^ contour feather with barbs and barbules ^ contour feather in which barbules interlock and produce a closed vane ^ flight feather with asymmetrical vanes. 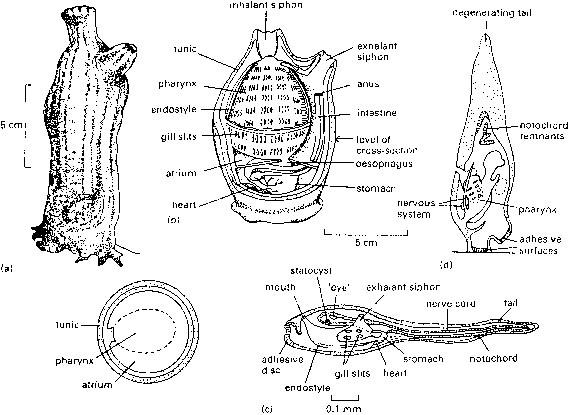 Sinosauropteryx, the most basal of the feathered dinosaurs known so far, has tufts of simple filaments (illustration (b)). Along the back, the fibres are 8-13mm long and there are about ten fibres per millimetre. Towards the end of the tail, the fibres may be up to 40 mm long. The therizinossauroid Beipiaosaurus has similar filaments, 50-70 mm long, associated with the bones of the forearm and leg. These are not the same as any modern feathers—they do not branch from the base as down feathers do, nor are they bristles. On the other hand, they occur on the skin surface, they consist of filaments and preliminary geochemical studies suggest they are made from the protein beta keratin, as are the feathers of modern birds (Schweitzer, 2001), whereas mammalian hair and finger nails are made from alpha keratin. More derived maniraptorans show some advances. Protarchaeopteryx has two kinds of feathers: (1) contour feathers on the tail that are up to 160 mm long and have a rachis and two asymmetrical vanes made from numerous lateral barbs, and (2) fluffy feathers over the body and upper legs that comprise filaments about 30 mm long that are gathered at the base. Caudipteryx (illustrations (c, d)) has both of these feather types, as well as some 14 contour feathers attached along the second hand digit. function in insulation, and possibly also in display if they were brightly coloured. Contour feathers appeared first along the sides of the tail, and then behind the arm, in the maniraptorans. Their function in such non-flying dinosaurs is mysterious, unless they also formed part of a display structure. Only in the first bird, Archaeopteryx, did contour feathers take over a major role in flight. Read more about the discoveries and see colour images of the fossils at http://www.peabody.yale.edu/exhibits/cfd/ CFDintro.html and http://www.nhm.ac.uk/museum/tempexhib/dinobirds/, and of imaginative life restorations at http://www.austmus.gov.au/chinese_dinosaurs/feathered_dinosaurs/photo_gallery.htm. the Late Triassic and Early Jurassic were termed prosauropods. There has been some debate about whether the prosauropods form a distinct clade, but most evidence suggests that they do not and are out-groups of the Sauropoda (see Box 8.5). Thecodontosaurus, a basal sauropodomorph from the Upper Triassic of England (Figure 8.9), a lightly built herbivore 2.5m long (Benton et al., 2000a; Yates, 2003b), shows all the basic hallmarks of the clade: a small skull (c. 5% of body length), a downwards curve to the tip of the dentary (Figure 8.9(b)), lanceolate teeth with serrated crowns (Figure 8.1(d)), a long neck with ten or more cervical vertebrae, a huge thumb claw and no claws on fingers 4 and 5 (Figure 8.9(a)) and a short blade on the ilium. More derived 'prosauropods' include Plateosaurus (see pp. 188-9) as well as animals such as Riojasaurus from Argentina and Melanorosaurus from South Africa, which were obligatory quadrupeds up to 10 m long. their massive weight. The euhelopodids from the Middle Jurassic of China, such as Shunosaurus (Figure 8.10(a)), are generally regarded as basal sauropods (Upchurch, 1998), although they have been assigned a position close to titanosaurids by Wilson (2002). The skull of Shunosaurus is less open than that of other macronarians and the jaws were designed for slicing tough vegetation. The omeisaurids, such as Mamen-chisaurus from the Upper Jurassic of China, with an immensely long neck, appear to be close relatives of the euhelopodids. The remaining sauropods, the neosauropods, include Cetiosaurus (Figure 8.10(b)) from the Middle Jurassic of England, although its precise relationships are unclear. In Cetiosaurus, the external mandibular fenestra in the lower jaw has been lost and the lower temporal fenestra lies completely beneath the orbit. The neck has become elongate by lengthening of the cervical vertebrae and increasing their number to 12 or more. There are five or six sacral vertebrae and the limbs are rather pillar-like, as in elephants, an adaptation for weight-supporting. The fingers and toes are much shortened and phalanges lost (Upchurch, 1998). The cetiosaurids are close to the ancestry of the classic giant sauropods of the Late Jurassic, which split into two major lineages, the diplodocids and the macronarians (Upchurch, 1998;Wilson, 2002; see Box 8.5). The diplodocids, such as Diplodocus (Figure 8.10(c)) from the Upper Jurassic of North America, have a steeply sloping quadrate and a long broad snout with a small number of cylindrical pencil-like teeth at the front. The jutting teeth may have been used in a pin-cer-like fashion to crop vegetation. Neosauropod characters in the skull are: the nostrils and nasal bones have moved well back and the skull roof is shortened, the lower temporal fenestra lies largely beneath the orbit, the teeth point forwards and they are restricted to the anterior part of the jaws. 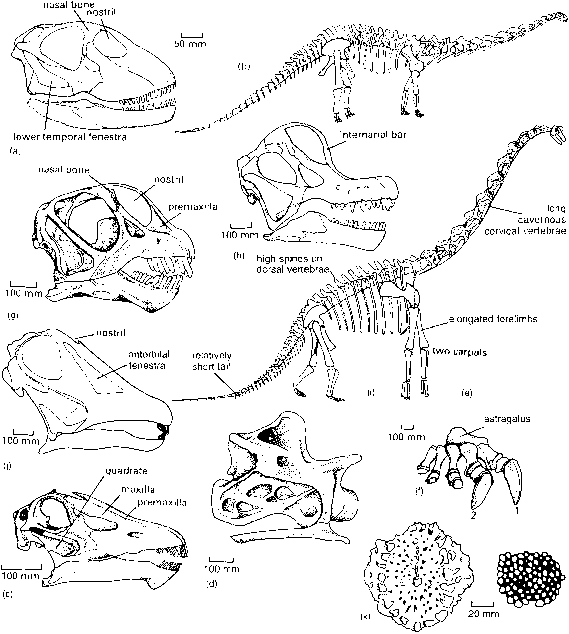 There has long been a debate about the function of the long neck of Diplodocus (see Box 8.3). The limbs of Diplodocus seem relatively slender, but the hands and feet (Figure 8.10(e,f)) are shortened weight-supporting structures. The wrist contains only two carpals and the ankle only the astragalus, all other elements having been lost or are present only as cartilaginous masses. The first finger and the first two toes bear long claws that may have been used in digging, but the other digits bear only small hoof-like nubbins of bone. 2 to enhance respiratory efficiency; birds, and presumably dinosaurs,breathe in a single direction, with the air entering the lungs, passing to the air sacs and then out, hence avoiding the 'dead space' of uncirculated air in mammals, which breathe in a tidal way ('in-out'). Weight reduction was clearly important in sauropods, and this and the efficient respiration system may have permitted them to function at large size and with long necks. The Macronaria include the camarasaurids, bra-chiosaurids and titanosaurids. 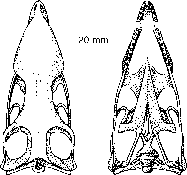 The camarasaurids and brachiosaurids share a skull pattern (Figure 8.10(g, h)) in which there is an arched internarial bar formed by very narrow premaxillae between the enlarged nostrils and a clearly defined snout. Brachiosaurus from the Upper Jurassic of North America and Tanzania is one of the largest dinosaurs known from a reasonably complete skeleton (Figure 8.10(i)). It is 23 m long, its head reaches 12 m above the ground and its weight has been estimated as 80 tonnes. Brachiosaurus is a dinosaurian giraffe, designed to reach high into trees, and the body shape differs from other sauropods in having longer forelimbs than hind and a shorter tail. The neck is greatly elongated and the cervical vertebrae are cavernous in order to save weight. There are massively elongated neural spines on the dorsal vertebrae, which indicate that Brachiosaurus had powerful muscles and ligaments to lift its crane-like neck up and down. Sauropods all had long necks and in some, such as Diplodocus, the neck at 6 m was as long as the body and tail together. Did these sauropods operate like reptilian giraffes, reaching high with their necks into the tops of trees? Indeed, could Diplodocus perhaps have reared up and balanced on a tripod formed from its hind legs and tail to reach up 10m or more? This view has been disputed by Crowther and Martin (1976) who showed that the neck of Cetiosaurus, for example, had to be held at a level below the shoulders (see Figure 8.10(b). Close study of the necks of the diplodocids Diplodocus and Apatosaurus has confirmed this conservative viewpoint. Stevens and Parrish (1999) measured the angles of movement between cervical vertebrae all along the necks of those two dinosaurs and entered the figures into their DinoMorph software. Summing all the horizontal and vertical measures showed that both dinosaurs had a narrow envelope of neck movement. The envelope can be thought of as a huge cone, expanding from the root of the neck: at most Diplodocus and Apatosaurus could swing their heads 4 m to either side. Diplodocus could raise its head to shoulder level, about 4 m above the ground, but Apatosaurus had a more flexible neck and could raise its head to 6 m. Oddly, both dinosaurs could bend their necks down to a level some 1.5 m below ground level. But they were not burrowers! The downward neck bend may have been used for snatching plants from ponds and rivers. Stevens and Parrish (1999) have shown that neither of these sauropods could have swung its neck above the horizontal —the arrangement of zygapophyses would have prevented it—but they might have been able to rear up on their hind legs to extend their reach. Other sauropods such as Brachiosaurus (see Figure 8.10(i)) did have more vertically placed necks and could have fed higher in trees. Explore the DinoMorph software at http://www.cs.uoregon. eduA~ken17dinoMorph.html and view an animated Apatosaurus at http://www.nationalgeographic.com/ dinorama/sauro.html. throughout the Cretaceous (Wilson & Upchurch, 2003). The skull (Figure 8.10(j)) was superficially like that of Diplodocus and the body was covered with an armour of roughly hexagonal bony plates (Figure 8.10(k)). New analyses (Curry Rogers and Forster, 2001; Wilson, 2002) suggest that Nemegtosaurus and Quaesitosaurus from the Upper Cretaceous of Mongolia, formerly classed as relatives of Diplodocus, are titanosaurids, although Upchurch (1999) makes a strong case that they are diplodocids. Brachiosaurus was huge, but other sauropods might have been larger, although most are incomplete. The titanosaurid Argentinosaurus might have weighed 50-100 tonnes in life, close to the theoretical maximum size that any land animal could achieve without rendering itself unable to walk. As body size increases, the cross-sectional area of the legs increases in proportion: small animals have slender legs, whereas large animals have legs like tree trunks. At body weights of more than 100-150 tonnes, the cross-sectional areas of the legs would become so large that all four limbs would meet as a solid mass under the body.